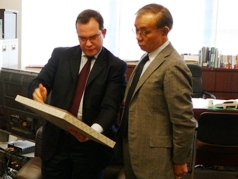 The Agreement on cooperation between the Singidunum University from Belgrade and Teikyo University from Japan has been signed by the representatives of both universities at the Hachioji Campus of Teikyo University, on June 29, 2009. On behalf of Singidunum, Prof. Dr. Nada Popovic Perisic, Dean of the Faculty for Media and Communication and Dean of the School of Diplomacy and International Relations (in the process of establishing) has signed the Agreement on the Serbian side, while Mr. Yoshihito Okinaga, President of the Teikyo University Group, headed the Japanese side. The Agreement envisages the exchange of students and professors, credit equivalences, joint researches and projects, as well as joint publishing activity. The Agreement on cooperation between Singidunum and Teikyo universities is the first of its kind that has been concluded between the private universities of the two countries. 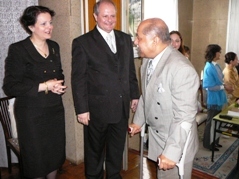 It is expected to widely contribute to the scientific and educational exchange, as well as to the enhancement of bilateral relations and friendship between Serbia and Japan. 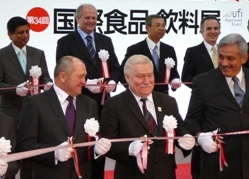 "Asahi Food & Healthcare Co. Ltd." together with "Mitsui Co." joined hands with the American partners to start a new production in the food industry in Serbia. President of "Asahi Food", Mr. Hikaru Kawamura, visited our Embassy with his colleague and exchanged views with our Ambassador inform about this important project, which aim to the markets in Europe, US and even Japan. 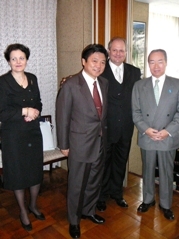 Mr. Yasutoshi Nishimura, Parliamentary Vice Minister for Foreign Affairs of Japan, who is also a member of the Japan-Serbia Parliamentary Friendship League, visited Serbia on May 23, 2009. During his stay in Belgrade, Mr. Nishimura held talks with the Minister of Foreign Affairs of Serbia Mr. Vuk Jeremic and Deputy Prime Minister Mr. Bozidar Djelic, about future bilateral cooperation in the field of political dialogue, economic relations, visa regime and many other issues. Once again, we had the pleasure of hosting a high school students' visit to our Embassy. We introduced to students from Nara Prefecture our Embassy's facilities and work, showed them Serbian national costumes and other handicrafts and talked about all aspects of Serbian history, tradition and culture, they were interested in. We really had a nice time together learning something new about Serbia. 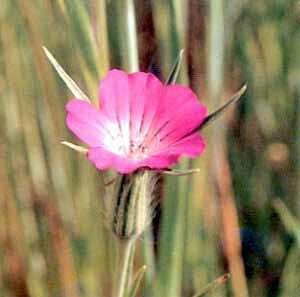 Japanese company "Nagai Hoshi" and Serbian company "Agrostemin D.O.O." signed contract on representing this Serbian company and its product, Agrostemin, in the Japanese market. Signing of contract between "Nagai Hoshi" and "Agrostemin D.O.O." is expected to enable export of this famous Serbian product not only to the Japanese market, but to other countries' markets as well. Representative of Ministry of Economy and Regional Development of Serbia, Mr. Miroslav Spasojevic, Chief of Sustainable Development Section, participated in this year's JICA Program "Energy Policy JFY 2009"
Serbia is committed to the Kyoto Protocol Agenda as developing country and is committed to follow its European counterparts in negotiations for the new, Post Kyoto agreement, expected to be reached in UNFCC Conference in Denmark in December. In regard to this policy, Serbia needs Japanese support to contribute to the protection of environment and its sustainability. JICA Program was good opportunity to exhange opinions with Japanese side on this matter. 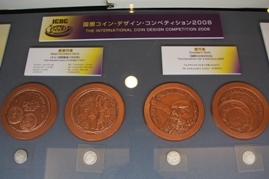 Ms. Aleksandra Stokic from Serbia was awarded for her design of the coin on the theme "The International Year of Astronomy 2009" in the International Coin Design Competition organized by Japan Mint. 67 works competed from more than 10 countries. 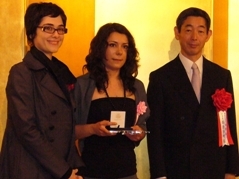 It is the third award for Ms. Stokic in this competition, which she received at the award ceremony on May 1st in Tokyo. The representatives from mints of Canada, Ukraine, Australia, diplomatic corps and our Embassy were also present at the ceremony. During his official stay, Deputy Prime Minister Mr. Djelić had a range of meetings aimed at enhancing bilateral economic and scientific cooperation and strenghtening political dialogue between our two countries. Deputy Prime Minister Djelic talked with governmental officials and high representatives about possibilites of closer cooperation in the various projects in Serbia, seeking their support and opinion on issues of mutual interest. He also informed Japanese counterparts about the current political and economic situation in Serbia, attractive opportunities for bigger Japanese investments and ongoing initiatives in the field of trade, science and overall bilateral cooperation. 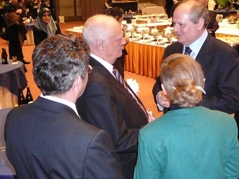 Deputy Prime Minister's schedule also included talks with Japanese business circles. H.E. 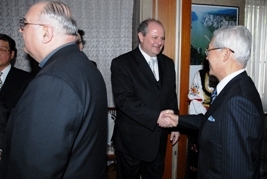 Mr. Djelic had encountered a warm welcome in Osaka by Honorary Consul Mr. Naohide Ueyama and his associates. 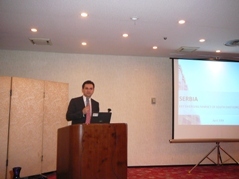 With their kind support, Deputy Prime Minister held a presentation on economic sitation in Serbia during Serbian Business Seminar organized for this occasion in Osaka Chamber of Commerce on April 15, which attracted attention of many leading Japanese companies and media. Having also in mind the importance of Japan as a leader in the field of science and advanced techologies, H.E. 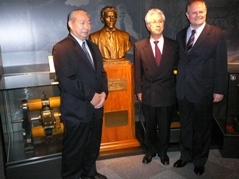 Mr. Bozidar Djelic visited two highly valued national institutes, that nurture long and fruitful cooperation with our distinguished scientists and experts: the National Institute for Fusion Science (NIFS) in Gifu Prefecture and the National Institute of Advanced Industrial Science and Technology (AIST). H.E. 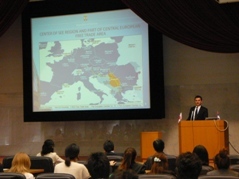 Mr. Djelic met with his counterparts from renowned universities of Tokyo, Kyoto and Keio and was given an opportunity to give a lecture on Serbian and European Integration at Aoyama Gakuin University in Tokyo. Serbian children awarded at "The 16th Annual World Children's Picture Contest"
On March 27th, among close to 52,000 applicants from 68 countries, four Serbian children - Nenad Kuzmanovski, Dejana Bukazić, Marko Molnar and Kristina Jovanović - were awarded for their pictures at this event organized by charitable organization IE-NO-HIKARI Association. 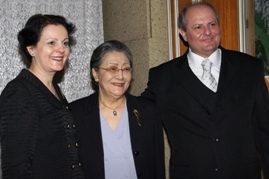 Embassy representatives from each awarded country were invited to attend the award ceremony in Tokyo. Japanese organization "Japan Yugo Art Project" together with Serbian curator Stepanov, galleries Toki Art Space and Den, hosted two exhibitions of seven representative visual artists from Vojvodina region for the first time, curated by Mr. Sava Stepanov from "Golden Eye Gallery" in Novi Sad. The first installation of "Visual Art in Vojvodina" exhibition was opened in Toki Art Space from March 23-29, followed by the other in Gallery Den (www.gendaiheights.fc2.com) from March 26 - 31. 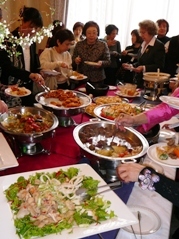 On March 16, Japanese organization "Japan Yugo Art Project" together with Bumpodo Gallery (www.bumpodo.co.jp) in Tokyo opened an exhibition of works from the collection of Iwano Atelier, that was first held in the Fukui City Museum of Arts 2 years ago. 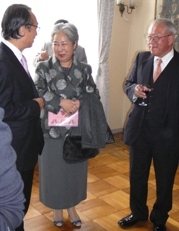 It included art works produced during years of cooperation between Mr. Heizaburo Iwano, one of the three best known specialists for hand made washi paper in Japan, and the Serbian artists. Every year, at the international art workshops organized by ";The Iwano Project" in Serbia, artists create using Iwano's hand made paper. 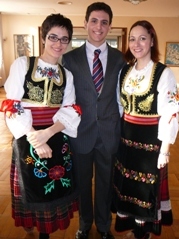 On invitation by the Japanese government, Mr. Jovan Ratković, Foreign Policy Adviser to the President of the Republic of Serbia, Mr. Boris Tadić, took participation in this year program "Leaders in the next generations", held for representatives from eight countries of South and Eastern Europe. During the program, Mr. Ratković attended various seminars and lecture on political and economic situation in Japan by distinguished governmental representatives. 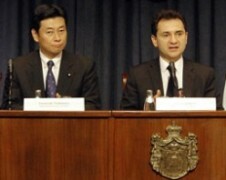 He also informed Japanese and other counterparts about political situation in Serbia at the Opinion Exchange session on the first day of the program and during his separately held talks with Mr. Ichiro Aisawa, President of Parlamentary League of Japan - Serbia Friendship, and Mr. Yasuaki Tanizaki, Director General for Europe at the MOFA. From March 7 to April 12, Seto City Museum of Arts in Aichi Prefecture (http://www.city.seto.aichi.jp/setomono/art/) is having a joint exhibition of works by this year's participants in Seto International Ceramic & Glass Exchange Programe 2008-2009. Ms. Lana Tikvesa, Serbian ceramic artist and Assistant Professor at the Applied Arts Faculty, University of Arts in Belgrade, who had the opportunity to be a part of this program, will also have her works presented. Following the positive experience in Serbia's participation in last year's fair with its first solo stand, six Serbian companies ("Sicoberry", "IGDA Impex", "Elixir Food", "Frigo Grand", "Sirogojno Company" and "Wine Cellar Jelić"), supported by Serbian Investment and Export Promotion Agency (SIEPA) and this Embassy, had the pleasure of exhibiting their line of products to many interested Japanese and foreign visitors and companies. 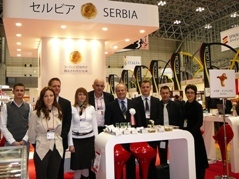 Among 2400 exhibitors from various countries in FOODEX 2009 (March 3 - 7), Serbia presented its fruit, mushroom and wine selection, that had gained international attention and awards, establishing also good business cooperation around the world. 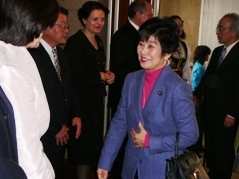 On this occasion, Ambassador Mrkić attended the opening ceremony with other distinguished guests from Japanese and foreign governments and diplomatic corps. 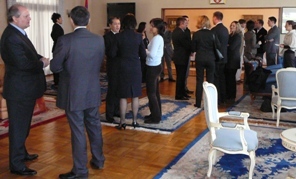 As a part of our efforts to promote Serbian industry in Japan, Embassy hosted a coctail for Serbian participants and Japanese companies on March 2nd. On February 16, the Embassy organized its annual reception on the occasion of Serbian National Day known as "Sretenje" which is formally commemorated as public holiday on February 15. This year we had more than four hundred distinguished guests joining us in the celebration. 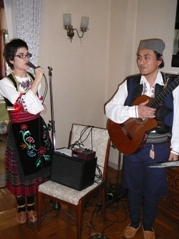 Representatives from Japanese political, business, academic, cultural circles and media, foreign diplomatic missions and Serbian expatriate community enjoyed in our traditional cuisine and music, performed by Japanese guitarist Mr. Shimodate. Group of students of "Kuki Junior High School" from Saitama Prefecture visited the Embassy, as a part of their Studies for International Understanding. In lively conversation on various topics with Ms. Kovač, in charge of cultural affairs, students had the opportunity to hear more about Serbian education system, traditions, sports and cuisine. Ambassador Mrkić met with Mr. Y. Okinaga, the President of Teikyo University, in Tokyo to discuss the possibilities of strengthening academic cooperation through joint projects and exchange programs with private universities in Serbia. 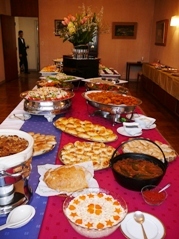 Teikyo University was established in 1930's in Tokyo and has branch offices in USA, Great Britain and Asian countries. Japanese university with such a good reputation and wide international academic network as this one, is seen as a valuable experience and an important partner to a still young private university sector in Serbia. 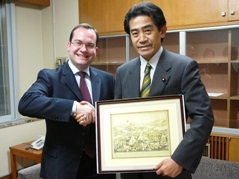 Taking into the account that Mr. Kenzo Yoneda, Chairman of the Governing Board of Japan - Serbia Friendship Association, is also a Professor of International Relations at Teikyo University, the cooperation between our universities would definitely contribute more to the friendship between Serbia and Japan. 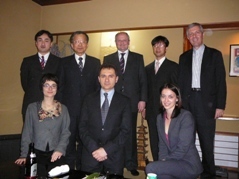 Two Serbian specialists from Clinical Center of Serbia, Prof. Dr. Miodrag Ostojić and Prof. Dr Milan Nedeljković, visited Japan again to participate at this year's International Congress "CCT 2009 Complex Cardiovascular Therapeutics" in Kobe, from January 29th till January 31st. 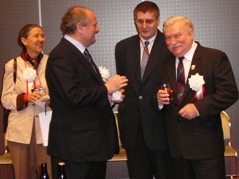 They participated in the last year's "CCT 2008 Complex Catheter Therapeutics" when Dr. Ostojić, President of Cardiology Society of Serbia, Member of Serbian Academy of Sciences and Arts and Head of Department of Cardiology, gave a presentation at Congress in Kobe, sharing his experiences in cardiovascular treatment in Serbia. We had a pleasure to meet a group of young Japanese students, who were eager to learn more about Serbia, its world heritage, traditional food, customs, sports and educational system. Our Embassy is usually a subject of interest of high schools from around Japan, which are more involved with international exchange and foreign cultures, so we were excited to meet even younger generations, also curious and determined to contribute to the friendship between our countries. We had very enjoyable and fun time together and are looking forward to meet other visitors in the near future. Ms. Lana Tikveša, Serbian ceramic artist and Assistant Professor at the Applied Arts Faculty, University of Arts in Belgrade, is participating in this year's Seto International Ceramic & Glass Exchange Programe 2008-2009, Part 2 (January 7th - February 28th), organized by Seto City Cultural Foundation. This is another artist from Serbia, invited to be in this program, along with Prof. Velimir Vukičević from University of Arts in Belgrade who participated in 2007. Ms. Tikveša gave a lecture on January 16th in the Seto City Cultural Center on Serbian contemporary ceramics from 1990-2008. For details regarding the lecture and other activities planned during the program, please see the inclosed leaflet (Japanese language only).